Today, my friends, is college move-in day. So, I have been trying to keep myself especially busy over the last few weeks as a distraction from the fact that our nest is about to be empty. One of my projects is a going away present, which would be appropriate for just about any college-aged kid young adult. It's the "last clean t-shirt." I used my Silhouette Studio software to create my design. You are welcome to download my Last Clean T-Shirt file (it is in Version 3 of Silhouette Studio) or create your own. If you create your own, don't forget to reverse the text before you cut. 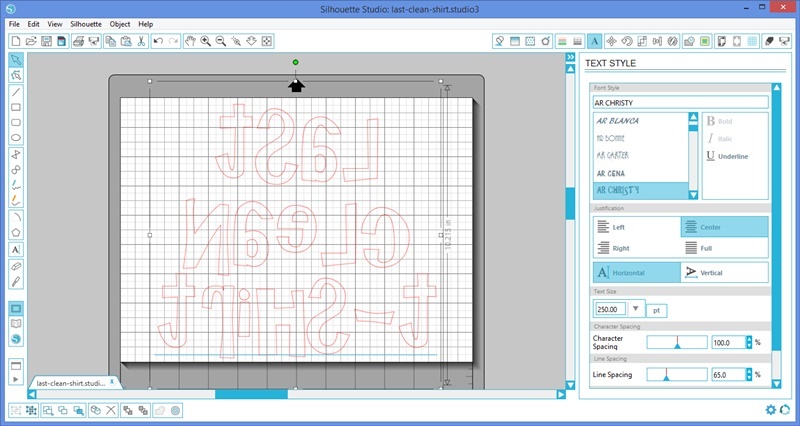 Use your Silhouette Cameo to cut your design from the heat transfer material. Peel off any excess material that is not a part of your design. Position the heat transfer material on a clean shirt. Tip: Whenever you are putting designs on adult sized shirts, you want to position them at least 2-2.5 inches from the neckline, that's about 3-4 finger widths if you don't have a ruler handy. Follow the package directions to iron on the design. Finally, you might want to package up your shirt with some detergent and a roll of quarters so your college student is ready for the joys of laundry day! Free Download: It's college move-in day, so, I have been trying to keep myself especially busy with projects like this "last clean t-shirt," perfect for any college bound student.